World War I did not get off to a great start for Maurice Buckley (pictured second from left), one of Australia’s bravest soldiers and perhaps my favorite Victoria Cross (VC) recipient. After signing up to join the famed Australian Light Horse Brigade Maurice was shipped off to Egypt on his way to the infamous cliffs of Gallipoli. No sooner had he sighted the Pyramids then he was sent back home after contracting a venereal disease. On his return the shame became too great and he promptly deserted. As the war dragged into 1915 and then 1916 Buckley became determined to redeem himself and re-enlisted using his dead brother’s first name and his mother’s maiden name. ‘Gerald Sexton’ landed in the Somme, the bloodiest of all bloodbaths, in early 1917. By late 1918 as the war approached its zenith he had earned himself the rank of Sergeant and a Distinguished Conduct Medal. On 18 September, 2018, as part of the AIF’s assault on the German held village of St Quentin, under the command of Sir John Monash, he was to display bravery that 100 years and one month later still sends a shiver down your spine. Sexton rushed at least six enemy machine-gun positions, captured a field gun, and took nearly 100 prisoners. He was originally handed the VC under his adopted name before revealing his true identity and having it gazetted in his real name. He would tragically die in a horse riding accident in 1921. Far more than Gallipoli, I have always wanted to see the battlefields of the Western Front where so many Australian soldiers gave their lives. After first reading Buckley’s story in Sir John Monash’s biography I am determined my tour will start and end in the little village of Le Verguier. Perhaps there is special memorial to the deserter turned hero. This desire to travel half way across the world to feel close to something that happened more than 100 years ago is down to power of narrative storytelling. As a reader, you don’t often think about why stories reach out and touch something deeper inside you. As a storyteller with the goal of driving behaviour and actions it is important to understand the how and the why. While there are many opinions about what it takes to reach a level of engagement with an audience that prompts action, you won’t often hear the scientific perspective. As a creative industry content marketing and public relations have enough trouble dealing with the rise of big data without also having to put on a white coat and visit a lab. However, there is a now a small but growing field of study that examines the cold, hard science behind how storytelling works. It seeks to understand why narrative sticks in our brain, moves us (literally) and produces increased empathy. The major research and findings have already delivered some pretty informative insights. For instance, using magnetic resonance imaging (MRI) research has shown the certain language (such as descriptive and figurative) lights up neurological regions that incite action and movement. This means a good story inspires and motivates you to do something. When your emotional your body often releases dopamine. Dopamine helps us remember an experience with greater accuracy. A story that touches someone on an emotional level will be much more easily remembered and recalled. Research by the Center for Neuroeconomics Studies shows character-driven stories with emotional content result in a better understanding of the key points a speaker wishes to make and enable better recall of these points weeks later. This is because character-driven stories cause a reaction, called oxytocin synthesis, that motivates cooperation with others. (READ MORE). Each of these helps explains why after reading the story of Maurice Buckley my ability to recall and act on the story was so strong. So next time you read something amazing, remember it;s not all about emotions. It is just science. Producing high-quality narrative content can be time consuming and expensive. Whether it is based on research, customer testimonials or product focussed, your written content is the foundation of successful marketing. Well-executed high-impact narrative content will address your buyers’ concerns at every potential stumbling block throughout the buying cycle, easing their worries and ushering them to the next step in the process. Despite its importance many marketers will make the fundamental error of utilising narrative content in too few channels, wasting the opportunity to supercharge their return on investment. With some simple creative thinking every piece of content can, and should, be utilised across at least five different owned, earned and paid channels. Developing a simple strategy for each and every piece of content you produce to maximise its value across other channels should be a fundamental part of the ideation, planning and execution strategy. This re-purposing of content for alternative channels will supercharge your investment. Over many years as a publicist I’ve learned that high-quality, proprietary research is PR ‘gold’. Insightful research packaged in a good media release can deliver many multiples of return from editorial coverage in the earned media. But the story should never end there. The narrative essentials of a media release – strong headline, great lead paragraph, some quotes and background contextualisation – are often very specific to their purpose. However, like almost any piece of content produced for a specific purpose, it can form the genesis of countless other pieces. While a media release is great for sending to journalists and storing on the news section of your website, the re-purposing of it it for other channels will significantly amplify its value. Some of the most powerful content takes complex ideas and chunks them down into easily digestible bites – that is often the main purpose of a media release. For large parts of your audience, shortening narrative content down to a few hundred words or less is ideal. But for a small part of your audience, particularly if you work in the B2B space, long form content of more than 2,000 words can be extremely engaging and valuable. Taking the time to expand your media release into a more detailed narrative and integrating an SEO keyword strategy with more of everything may take some time, it is these pieces that often become extremely valuable evergreen content that attracts traffic for months and years. Many marketers often neglect using narrative content in paid media channels. Using narrative content in paid channels is primarily done using native advertising. For the uninitiated, native advertising is the use of paid ads that match the look, feel and function of the media format in which they appear. Native ads are often found in social media feeds, or as recommended content on a web page. Unlike display ads or banner ads, native ads don’t really look like ads . They look like part of the editorial flow of the page. READ MORE: Native Ad Spend Will Make Up Nearly 60% of Display Spending in 2018. 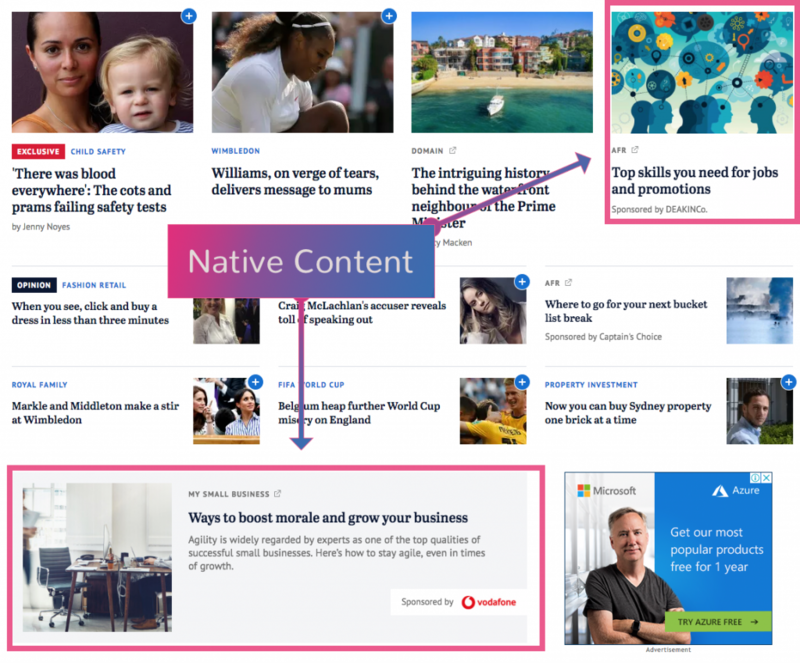 The key to native advertising is that it is non-disruptive – it exposes the reader to advertising content without sticking out like a sore thumb. Highly-engaging narrative content utilising the principals of narrative storytelling are most suited to native advertising. The main priority of marketers requires that are often focussed exclusively on external audiences. Finding and recruiting new customers is their primary purpose. Sometimes, particularly in large companies, there can be a large disconnect between the way a brand is positioned externally and the way other, non marketing, functions within a company see the brand. Sharing narrative content and explaining the how, why, what and where it is being used externally is a great way to build a commonality of purpose within an organisation. If product developers know how their work is being sold to customers there should be a much greater alignment of interests. Findings from the 2015 Content Preferences Survey show that a majority (91%) of buyers prefer visual and interactive content rather than traditional, text-based formats. This higher level of buyer engagement offers prospects a more valuable buying experience — while also providing marketers with deeper insights for future marketing initiatives. Adding interactive elements to popular content formats such as video can boost engagement and lead to greater insights about prospective buyers, experts noted. Short videos, image galleries, infographics, interactive tools, calculators are all great tools to give your narrative content so extra oomph. Even a simple thing like extracting a quote from the piece and turning it into a graphic can improve engagement. This list is by no means exhaustive but a good start to understanding how getting creative can turn one idea into many opportunities. Marketing’s transition from art to science continues to gather pace with top-performing companies almost three times as likely as their mainstream peers to have invested in an integrated, cloud-based technology stack. Econsultancy’s 2018 Digital Trends report, published in association with Adobe, is based on a global survey of 12,795 marketing, creative and technology professionals in the digital industry across EMEA, North America and Asia Pacific. One of the most important takeaways from the report is the impact of marketing technology infrastructure, or tech stack. The reports showed that while just over one-in-ten respondents have “a highly-integrated, cloud-based tech stack” those that do are almost three times more likely than their mainstream peers to outperform competitors (25% vs. 9%). The bottom line is the nature of a company’s technology infrastructure can make or break its attempts to provide an optimal experience for customers across a growing number of channels and touchpoints. 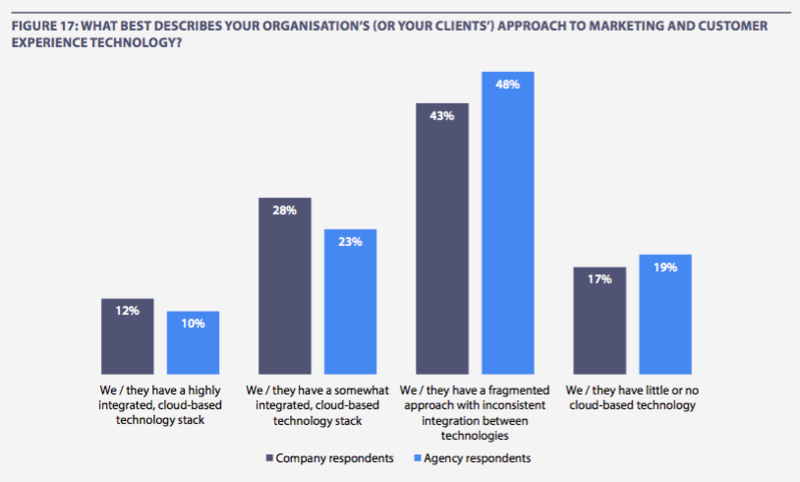 Despite this, organisations are most likely to have a fragmented approach with inconsistent integration between technologies, an unsatisfactory state of affairs indicated by 43% of company and 48% of agency respondents. A lack of integration reduces the chances of providing a seamless customer experience. It can also be frustrating for marketers and other employees who want to go about their jobs without unnecessary restrictions in their ability to acquire, retain and delight customers. With an ever-growing number of marketing technology point solutions available (more than 5,000 at the last count), it is no surprise that many companies are struggling to build the kind of unifed platform that is increasingly a prerequisite for success. The other major takeaway from the report was the growing importance of customer experience (CX), as well as the content required to facilitate this. Organisations committed to CX were shown to outperform their peers. Asked about the single most exciting opportunity for the year ahead, optimising customer experience (19%) again comes out on top, ahead of data-driven marketing that focuses on the individual (16%) and creating compelling content for digital experiences (14%). Organisations with a ‘cross-team approach with the customer at the heart of all initiatives’ are nearly twice as likely to have exceeded their top 2017 business goal by a significant margin (20% vs. 11%). Just under two-thirds (62%) of companies agree they have ‘a cohesive plan, long-term view and executive support for the future of [their] customer’. The top strategic priority for organisations in 2018 is content and experience management. Almost half (45%) of companies surveyed rank this as one of their three most important priority areas for the year ahead, with a fifth (20%) stating that this is their primary focus. 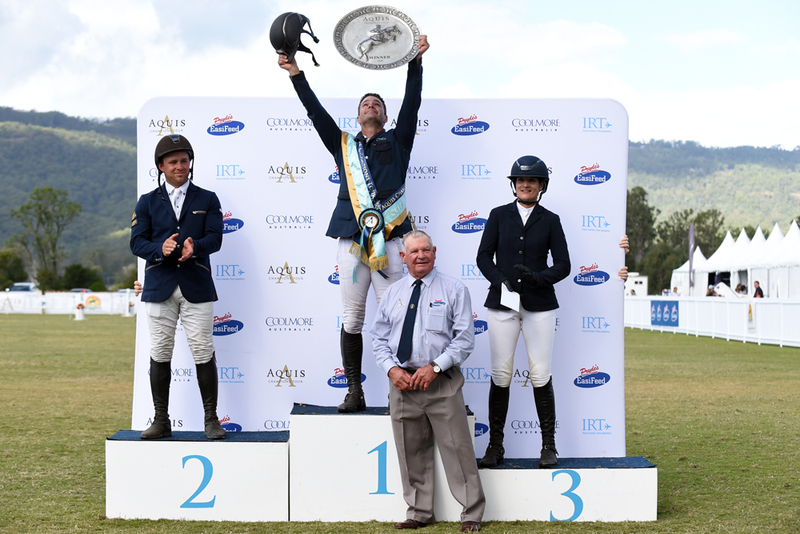 The Aquis Champions Tour showjumping event has concluded at Elysian Fields at Canungra on Sunday (May 6) with a narrow win by rider Merrick Ubank after he rode Alantinus to win the Pryde’s EasiFeed Gold Tour Final on Sunday in front of an excited crowd. Ubank scored the win by just .35 of a second from Clint Beresford and Emmaville Jitterbug to claim the first prize of $35,000 in the richest event on the Australian Jumping calendar. More than 300 of Australia’s best showjumpers have competed on the Gold Coast in a nine-day program for more than $340,000 in total prize money at the third annual Aquis Champions Tour. Competition manager Michelle McMahon was delighted with the quality of competition at the prestigious event. The Coolmore Silver Tour was won by Stephen Dingwell riding Cavalier Du Rouet, just .06 of a second ahead of Tom McDermott and Elegance De La Charmille. McDermott had paid double entry fee for the chance to win triple prizemoney, which resulted in him winning $12,000 for this class. McDermott riding Alpha Activity then went on to win the hard-fought IRT Bronze Tour. He beat Chris Chugg and KG Queenie with a huge gallop to the last fence for another $10,500 in prizemoney. The junior championship was won by Jess Rice-Ward riding Dusky Farm Cavalier, while the amateur championship went to Morgan Daniel and Aladino. Jessie O’Connell rode Cassis Z Ten Halven to win the young rider championship. The final event of the day is always a crowd favourite and this year did not disappoint. The winner of the Gollan Racing Speed Derby with an impressive clear 84.68 seconds was Clint Beresford riding SL Donato. Second place went to Katie Laurie riding Cera Caruso and third was the entertaining Ron Easey riding Simplistic with a time of 87.49. Spread over almost 500 acres of prime pristine rural land at Canungra on the Gold Coast hinterland Elysian Fields features polo fields, show jumping facilities and acres of riding and relaxation country, plus luxury accommodation. The facility, which has previously hosted a concert by Elton John, is the home of the biggest prize money show jumping competitions ever held in Queensland and the location for the highest level of polo tournaments ever played in Queensland. Marketing technology (Martech) has exploded to almost unfathomable size in recent years. Few other areas have been disrupted, and continue to be disrupted, by technology more than the art of securing new customers. The graphic above was first produced in 2011 with 150 companies operating in the martech space. In 2015, it had grown to 2,000. Last year, it nearly doubled from that to the 3,500 mark. This year, it includes nearly 5,000. For the average small business operator who also needs to be on top of accounting tech, product tech, HR and all the other techs, finding the right blend of solutions, or tech stack, for a high-performing marketing framework can be daunting. For our own business, clients and in-house projects we have trialed dozens of new technologies designed to make marketing more effective while reducing the financial and human resources required to deliver genuine results. If I knew five years ago what I know now and was starting my own small business these are the essential technologies I would invest time and money learning to use. The payoff will be immense. Your website is the foundation of all marketing. Using a content management system (CMS) that allows you to quickly and efficiently load products, add and edit content, integrate other technologies and manage security is essential. Don’t be conned into paying big fees for a complex proprietary or custom CMS. Demand your provider use an open source platform like WordPress. If you are planning an online store, the WooCommerce platform was made for WordPress. If you elect to outsource building of the site to someone else it is essential you take the time to understand how it works. What plugins you are utilising, what structures have been established and what the SEO strategy is. It will grow to become your most important marketing asset. Cost: WordPress is Free but factor in cost of buying domains, hosting, themes, plugins, security and backups. Many years ago I had an idea for a website that eventually became www.mbanews.com.au. I visited a range of web developers all with their own custom/proprietary CMS. The development quotes came in at $15,000-$75,000. This was well beyond the $3.50 I had planned to spend. One of the best pieces of advice I ever received was someone who told me to “Lock yourself in a room for a weekend and learn WordPress”. So I did. Four years later the site attracts more than 10,000 unique browsers a month and has become the number one source for potential MBAs in Australia. The external cost to get the site live $0.00. Well inside my budget. Building a database of satisfied, engaged customers who do your marketing for you by word of mouth is easily the most cost effective form of marketing, because it costs virtually nothing. While there are literally hundreds of solutions available for email marketing, for ease of use, low cost and extensive range of integrations we recommend MailChimp. The core platform makes building lists, creating emails and understanding the results easy. With an ever-growing range of integrations, including the ability to develop Google remarketing ads, it will change the way you reach your customers. Cost: Free for up to 2,000 subscribers and 12,00 emails per month. Understanding how your customers are interacting with your website is essential to the continual task of refining your product and marketing messages. Intalling, monitoring and using the insights provided by Google Analytics. The range of data available to businesses from Google Analytics is simply extraordinary. The biggest challenge you will find is isolating and utilizing the data that is of most value to you. Again, the easiest way to get your head around the complexity is to take a deep dive; immerse yourself in it for a day, the knowledge you gain will last years. No other area of martech is populated by more sharks than online advertising. Some of these sharks have built very big businesses on their ability to separate small business people from their money on the promise of an avalanche of customers. Most of their customers are left confused, and poorer, with little to show. Depending on the goals of your business, Google advertising should be a large chunk of your budget. Whether you are DIY or using an agency, managing the effectiveness of this spend to ensure you are maximising ROI is easy with a platform like WordStream. One of the many benefits of WordStream is the extensive resources available (for free) to help you get the maximum from every dollar. Advertising on social media platforms, particularly Facebook, is increasingly easy with ex Many people have built. Cost: How much have you got? External AdWords management can be charged as a flat fee (including set-up and ongoing management fee) or as a percentage of your spend. Bigger agencies will charge 15-20% while smaller agencies (like us) charge 10% with a minimum fee. Search Engine Optimistaion (SEO) is how you ensure customers looking for your products can you find you easily and before they find your customers. Great content is the foundation of all SEO and your website should be a highly-tuned SEO machine. Once you have your site humming, developing off-site SEO tactics like backlinks, can take your traffic stats to the next level. We used a range of different SEO technologies before discovering Moz. If SEO is going to play an important part of your marketing, the Moz platform is essential. Identifying high value keywords, making content tweaks and tracking performance are all easier with Moz. Most small businesses don’t need to be told the importance of (organic) social media in their marketing. While paid advertising on social media platforms is important, building an organic social following is the sort of investment that will pay dividends for years. Like your website, content on social media is king. Monitoring what content is working and what is not can be made much easier with the use of martech like SproutSocial and Hootsuite. We use both for our business and clients. With prices starting from $100/month it is a significant investment, especially when you can count your followers on one hand! But it is important to be persistent in posting content, understanding what works and why and refining your content to improve engagement. “We have seen steady and sustainable growth in prices for a number of years now despite a strong increase in the amount of new land being developed in the region,” Mr Khan said. 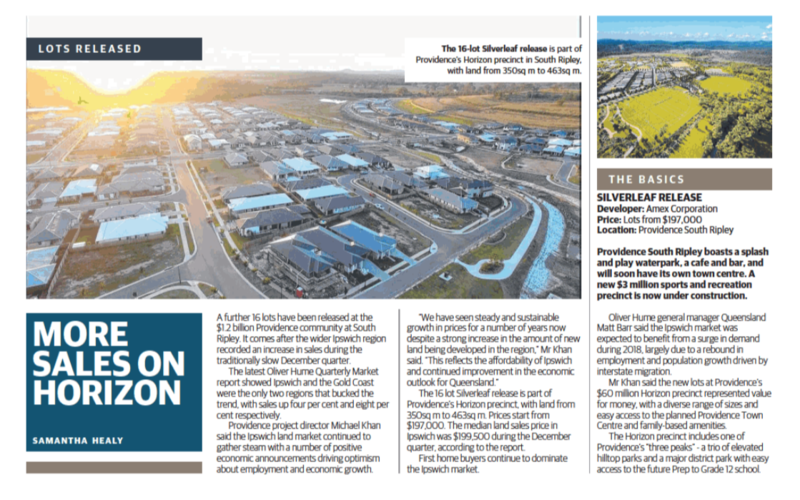 New research by Oliver Hume released last week showed the land market in the Ipswich was the second strongest performer in SEQ throughout 2017, with average prices rising 4%, behind only the Gold Coast where growth topped 8%. The average price for new land in Ipswich is now $199,500, compared to $384,200 on the Gold Coast and $230,000 in Logan. “Our new lots represent real value for money, with a diverse range of sizes and easy access to the planned Providence Town Centre and family-based amenities,” he said. The Horizon precinct includes one of Providence’s “three peaks” elevated hilltop parks and a major district park, with easy access to the future P-12 school. “We know that buyers are fuelled by a desire to have as much of their lives within easy reach while still able to maintain a quality lifestyle,” Mr Khan said. The irony of blogging about how to manufacture authenticity does not escape me. Surely being ‘real’ does not require an instructional video? Unfortunately, in the age of fake everything, it does. In modern corporate environments, particularly the marketing and communications space, we have developed a sophisticated language designed around coded phrases that have been deliberately created to squash authenticity. When a business claims to be leveraging a paradigm shift to move the needle towards a success narrative you know they are full of it and have lost the ability to communicate authentically. Why would you trust a brand or person that can’t even trust themselves enough to be themselves? Being authentic is not just a moral obligation, but can have serious benefits for your career or brand. There is no better example of the growing value of authenticity then the election of Donald Trump. Regardless of your political views, his campaign to win the Republican nomination and then defeat ‘Crooked Hillary’, was a masterclass in the value of being authentic. Despite his many other flaws, US voters developed an appreciation of his desire to not be anything else, other than himself. On the other hand, Hillary came to reflect everything that was manufactured; a slick careerist unable to say anything for fear of offending anyone. It became a choice between a flawed human and a perfect machine. People still trust people more than robots and the rest is history. So how can you be more authentic in your communications, and enjoy the benefits of more engagement, without appearing to be faking it? The courage to offend is often the first step towards authenticity. However, being courageous is not just about being an over-opinionated blowhard and saying whatever pops into your ahead. As Donald Trump will ultimately learn; manners and tone matter too. To courage to speak your mind, add respect. A simple acknowledgement of the fact you disagree sends a clear message about your intent to ‘agree to disagree’ and builds trust with your audience. Too much modern corporate and political spin is created to avoid any potential blowback from individuals or groups who may not agree with you. The ability to respectfully disagree while maintaining dignity and composure are essential to authenticity. Platitudes are statements, especially those with a moral content, that have been used too often to be interesting or thoughtful. Like clichés, they are lazy form of communication that indicate to your listener that you haven’t bothered to create original thought for them. Avoid clichés like the plague. Actions speak louder than words Speaking coach and author Nick Morgan believes a lot of coming across as authentic is in the non-verbal cues we give people. These non-verbal cues are the second conversation you are having with your audience and can have a huge impact on your ability to engage with people. Morgan identifies four aims (or intents) that give rise to authenticity. The intent to be open with your audience by relaxing, the intent to connect with your audience by keeping their attention, the intent to be passionate about your subject matter and the intent to ‘listen’ to your audience by adjusting to their needs or mood. Your staff and customers are facing and endless barrage of information meaning simplicity has never been more powerful or necessary. Effective leaders distill complex thoughts and strategies into simple, memorable terms that colleagues and customers can grasp and act upon. If you’re having trouble distilling something to its essence, it may be that you don’t understand it. So get clear and look out for technical jargon and business speak, which add complexity. Say what you mean in as few words as possible. These are of course only the basics but a good starting point to throwing off the shackles of fakery and beginning to build better relationships with your staff, colleagues, customers and partners by becoming a new, realer, you. What is Your Brand’s Editorial Mission? In the digital world every single brand, every single company, is a publisher. If you have a website, you are publisher, if you have a Facebook page, you are a publisher. If you send clients technical guides on how to use your products, you are a publisher. The key to being a great publisher is a strong, clearly-defined and purpose-driven editorial mission. An editorial mission is the foundation of your content strategy and defines what you’re going to talk about and share as a content creator. The term editorial has traditionally been reserved by newspapers for the section of the paper where the ‘editor’ expresses the publisher’s own views and policies on a current issue. It was always separate from the objective news ‘reporting’ of the paper that was meant to be devoid of the personal opinions of the journalist and their editor. As an example, it has long been a tradition of newspapers to use their editorial pages to endorse their preferred candidate ahead of an election. This decision is meant to be the considered wisdom of the editor or senior editorial team and until recently had the potential to swing undecided voters. In it’s strictest definition editorial content should not be influenced by outside forces. The Sydney Morning Herald (SMH) says there is ‘no advertiser influence’ in the creation of editorial features and in all case’s the editor’s decision about content and tone are ‘final’. Editorial is simply content that has been developed independent of outside influence, for no other purpose then providing the audience with information, insight and understanding. However, the incredible growth of content marketing and the digital economy has seen many of these walls heavily eroded with the definition of ‘editorial’ content now encompassing a complex array of goals and influences. Fairfax’s Domain business unit is one brand that has used editorial to grow traffic and engagement. 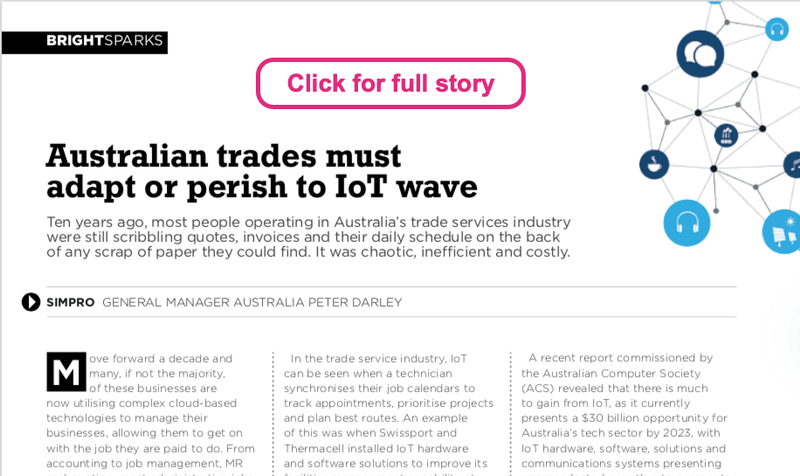 While the business is a relatively simple online listings business, the fact it is owned by Fairfax has provided the opportunity to use editorial as the spearhead for its marketing strategy. In an interview last year with CMO magazine Domain’s chief marketing and editorial officer Melina Cruickshank explained how the company bought together data-driven decision making, editorial content, audience-oriented marketing and mobile-first thinking to drive a 92% increase in unique browsers in 18 months. Editorial content is no longer the exclusive purview of pure media companies. Every brand that wants to communicate with customers should have an editorial mission that clearly articulates what they hope to achieve from their content. It should define you as a brand and what you stand for in the eyes of your stakeholders, both internal and external. At the core of editorial and its value to an audience is the substance and integrity of the opinions that it carries. Having an editorial mission that is simply about the features of your products and services does not count. Having an opinion about the externalities and influences that affect your customers is one of the easiest ways to supercharge your content strategy. Inform – provide the latest news, views and information about the courses available to people considering embarking on an MBA. Advocate – be a champion for MBAs and the pursuit of management excellence. Staying true to this mission has seen the site establish a reputation with both readers and advertisers as the first-stop for information about studying for an MBA in Australia. Taking the time to define what your content means to your audience via an editorial mission is the first step in developing an effective content strategy. So get to it. Leading equipment financier Silver Chef Limited (“Silver Chef” ASX: SIV) has today reported net profit after tax of $20.2 million for the year ending 30 June 2017. As expected, the Group delivered strong second half financial performance as a result of improvement in GoGetta rental yield, better average credit quality and continued growth of the Hospitality business in international markets. These improvements set up the business for strong growth in future periods. The full year result includes a significant one-off expense of $2.3M after income tax in respect of asset losses associated with the fraud event announced to the market on 17 November 2016. The small miss against the lower end of the earnings guidance range was a consequence of deliberate slowing of growth in the GoGetta rental asset base in the second half of FY17 and additional arrears provisioning which was determined as part of the year end accounts review process. Part of that difference arose from the Company’s decision to book additional provisioning against an individual customer arrears position where our recovery prospects deteriorated post year end. The Board has declared a fully franked dividend of 25.1 cents per share. In conjunction with the first half dividend of 12.9 cents per share, total dividends for the financial year are 38.0 cents per share, maintaining the Company’s payout ratio at 68.7% of earnings per share. The Hospitality business in Australia and New Zealand performed well during the year, with growth in its rental asset base of 26% against the previous corresponding period. The coffee and franchise channels made strong financial contributions during the period. The New Zealand business in particular contributed strongly, with 49% growth in its rental asset base against the previous corresponding period resulting in a significantly improved contribution to group earnings. The average credit quality of the Hospitality portfolio remains consistent with historical trends and reflects a relatively low level of annualised credit losses in the target range of 2.5% to 3.5% of revenue. The Canadian Hospitality business achieved the strong origination and asset base growth targets planned for the year. The business delivered $18.6 million in originations for the year ended 30 June 2017, up 48% on the previous corresponding period. Canada ends the year with a rental asset base of $28.7 million at cost, up 81% on the cost base at 30 June 2016. There are now 40 employees providing a strong platform for future growth. Due to the relative immaturity of the Canadian portfolio, it is difficult to make a firm prediction as to the average credit quality of that growing portfolio, however early indications are that it will perform on a similar basis to that observed in Australia and New Zealand. During the year, the Company improved its credit evaluation procedures, redesigned its approach to managing the recovery of outstanding arrears and commenced a project to review its processes for reconditioning and remarketing assets that are returned after the initial twelve-month rental period. As predicted, the GoGetta brand delivered an improved financial result in the second half of FY17. Growth in the GoGetta rental asset base was moderated as a result of implementing tightened credit controls. Average credit quality has improved as indicated by the deceleration in the rate of arrears growth. Critical to improving credit quality and halting arrears deterioration was the disaccreditation of non-performing partners (both finance brokers and equipment vendors) who were not aligned with the Group’s deal quality and customer credit standards. While slowing in the GoGetta growth rate was a natural by-product of the Company’s tightening credit standards, this was further enhanced by management actions taken in response to the fraud event announced on 17 November 2016. The Company previously advised that in the short term it expected bad debt and impairment charges recognised in the GoGetta business to be higher than historical group averages as management worked through contracts (primarily in the light commercial channel) which were written before significant tightening of credit policiesin March 2016. After ongoing evaluation, the Company concluded that a number of sub categories of customers and asset classes in the broader light commercial channel were not performing in line with our credit quality criteria. The Company has discontinued lending into those channels with the exception of vehicles which are specifically designed for commercial purposes (such as vans and utilities). The credit performance of the remaining classes in the light commercial channel are subject to ongoing review to ensure they are generating the appropriate returns and meet acceptable standards of credit performance moving forward. The Company’s total assets at 30 June 2017 are $540.2 million, with net gearing at 65%. The Company extended its senior syndicated banking facility by $100 million to a total of $400 million of which there was $81 million of headroom at year end. This provides the Company with significant funding headroom as it transitions to a securitised funding model in FY18. The Company is now in advanced stages of documentation and senior syndicate approval for the implementation of a $200 million securitisation warehouse facility. All parties are working toward execution of relevant documentation. Successful performance of the securitisation structure will see a significant reduction to senior debt gearing levels during FY18 and a lower level of reliance on new equity to finance the Company’s growth targets over the coming years. The facility permits funding of new originations of Silver Chef and GoGetta rental contracts, and will also be used to purchase the Company’s existing book of finance leases in the first instance, allowing a significant reduction to senior debt levels on first draw. Once implemented, the securitisation facility will enable the business to finance eligible contract originations to an initial maximum gearing of 80% on asset cost on a limited recourse basis. Final pricing for the securitisation warehouse structure will be established closer to financial close on the transaction. A share placement was made on 16 September 2016 to existing and new shareholders, that raised an additional $7.5 million of equity capital. An entitlement offer announced on 21 March 2017 raised a further $21 million of equity capital. Funds from these placements were used to fund growth in the Company’s rental asset base, and to maintain gearing at a conservative level as the Company transitions to securitisation funding. The Company will continue to apply its historical approach to the management of the Company’s capital base, seeking to diversify its funding sources with a range of features and maturities to manage refinancing risk and interest rate risk. The delivery of the securitisation facility in FY18 is an important evolution of the Group’s capital management strategy. Appropriate senior secured facilities and other forms of debt and equity capital will be required to ensure continuity of funding for both domestic and international expansion. Damien Guivarra transitioned to the role of Chief Executive Officer effective from 3 November 2016. On that date, Allan English, founder and former Executive Chairman, returned to the role of Non-Executive Chairman. Mr Guivarra has played an integral role in the growth of the Company over the last ten years across a number of sales and operational management roles. The Company remains committed to the ongoing development of its people, as part of its wider strategy as a certified B Corporation. Silver Chef is focused on running its business under a values driven framework with a genuine desire to make a wider contribution in the world. During FY17, we formalised strategies for better supporting our staff and our customers, reducing our environmental impact and creating more meaningful engagement with wider community initiatives through the establishment of the Silver Chef Foundation. The Company continues to develop a new application management system with a second major phase of improvements commencing during the year. The system will generate considerable efficiencies by reducing application processing times and allowing information to be imported directly from external equipment dealer and finance broker platforms. It will also allow for credit pre-approvals for certain customers to be provided instantly. The Board has declared a fully franked dividend of 25.1 cents per share. The record date for the dividend will be 8 September 2017 and the payment date will be 2 October 2017. In conjunction with the first half dividend of 12.9 cents per share, total dividends for the financial year are 38.0 cents per share, making the Company’s payout ratio 68.7% of earnings per share. Management believes that the long-term outlook for domestic growth for both the Silver Chef and GoGetta brands remains positive. Expansion in Canada will continue and strong growth is forecast in its rental asset base again in FY18. In the short term, improvement to yield and average credit quality in GoGetta will create a continued improvement to both return on capital and underlying accounting earnings. The Company is conscious that there are ongoing challenges associated with managing the existing portfolio of GoGetta contracts. As previously noted, this portfolio is comprised of a mixture of credit qualities that improved significantly after March 2016. The portion of the Company’s asset base in the GoGetta business which is underperforming from a credit perspective is being actively managed with a view to contracts either being paid out or assets being returned and re-deployed as a matter of priority. However, due to the volume of assets subject to this exercise, particularly in the light commercial channel, there is a significant cost burden associated with managing accelerated repossessions and redeployment of that capital. The financial impact of this activity is difficult to estimate, as it is dependent on the timing and condition of assets which are returned. While the company typically targets growth in the range of 10 to 20%, in light of the above, the forecast for FY18 is in the range of 5% to 15%. As such, the Company expects full year after tax earnings for FY18 in the range of $24 million to $26 million.